Illustrated with scores of drawings and halftone photos, this guidebook to the mythology of Mexico and Central America focuses mainly on Mexican Highland and Maya areas, due to their importance in Mesoamerican history. 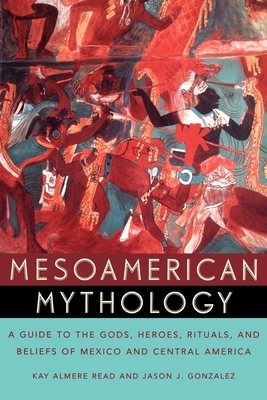 The opening section defines the nature of myth, the Mesoamericans as a people, and the cultural worldview underlying their myths, with a historical timeline from the Paleo-Indian Era to the present. Next, it presents a mythological timeline, some of which is in the characteristically poetic language of pre-Columbian folk tales. A detailed alphabetic listing of Mesoamerican deities, themes, and concepts forms a large part of the book. The extensive bibliography and resource list includes video and Web resources. Kay Almere Read is Associate Professor of Comparative Religion at DePaul University and is the author of Time and Sacrifice in the Aztec Cosmos. Jason J. Gonzalez is a graduate student in anthropology, specializing in Maya archaeology, at Southern Illinois University at Carbondale. He has extensive field-experience on archaeological projects in Mesoamerica and the United States, as well as on the Pacific islands of Micronesia.